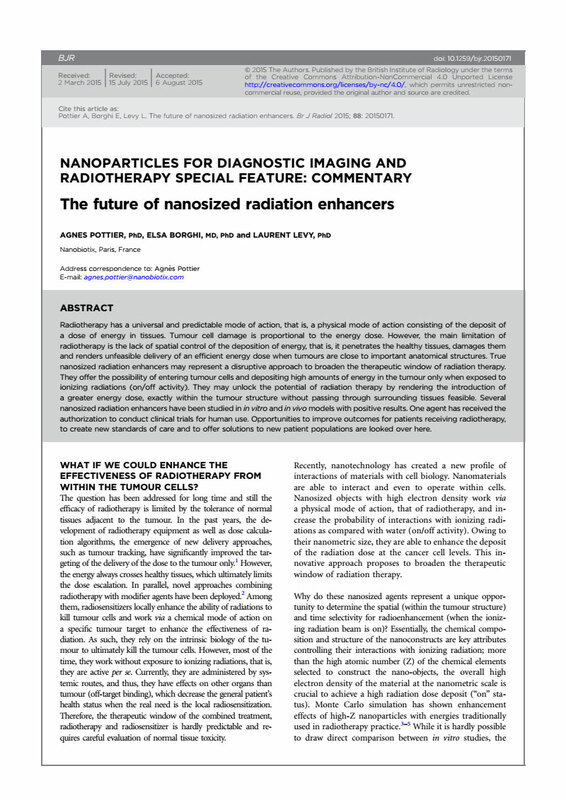 Nano Publications > Publications > Reviews > 2015 – The future of nanosized radiation enhancers – Pottier et al. They offer the possibility of entering tumour cells and depositing high amounts of energy in the tumour only when exposed to ionizing radiations (on/off activity). They may unlock the potential of radiation therapy by rendering the introduction of a greater energy dose, exactly within the tumour structure without passing through surrounding tissues feasible. Several nanosized radiation enhancers have been studied in in vitro and in vivo models with positive results. One agent has received the authorization to conduct clinical trials for human use. Opportunities to improve outcomes for patients receiving radiotherapy, to create new standards of care and to offer solutions to new patient populations are looked over here.